The purpose of this post is to summarize a recent manuscript that reviewed the current state of radiology smartphone medical apps. Readers should gain knowledge of the types of current radiology smartphone apps. The promise and perils of radiology smartphone apps will be highlighted. The visual foundation of radiology makes the specialty a promising area for smartphone and tablet app development. M.A. Rodrigues along with colleagues from Edinburgh, Scotland recently surveyed smartphone app stores for apps related to the specialty of radiology. 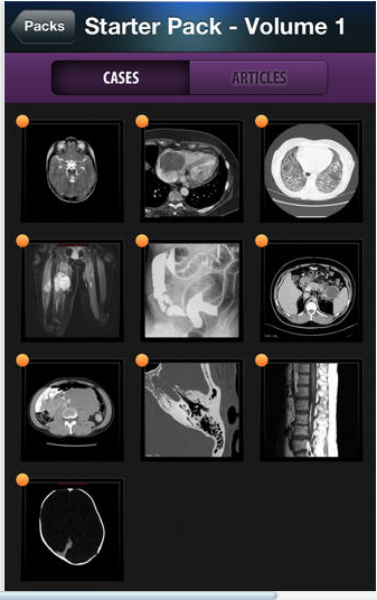 They categorized 321 apps and provided commentary on the state-of-the art radiology apps in the journal Insights Imaging. In this post, I will outline some of the key findings from their review. Smartphone and tablet apps with a focus on radiology teaching emerged as an early app category. Several current apps are available in this category that are targeted for physicians and other healthcare providers. Radiopaedia is an app designed for radiology residents that includes scrollable case images, questions and links to relevant research manuscripts. A variety of radiology reference apps are available that cover topics such as proper positioning for radiographs and proper staging of cancer from radiographic findings. 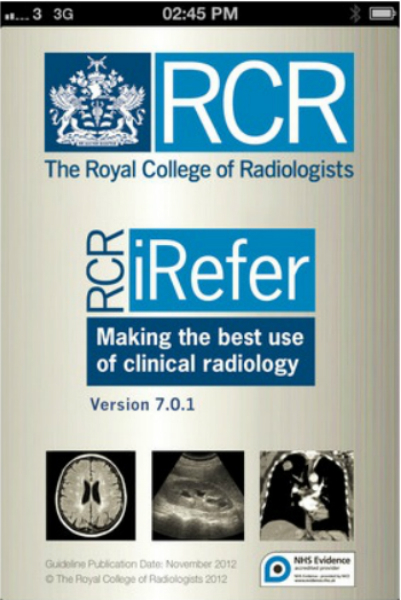 The Royal College of Radiologists developed a multi-platform reference tool called iRefer that provides guidelines for physicians in the selection of the most appropriate imaging tests for specific clinical scenarios. Software systems with smartphone and tablet apps are available that can organize films to be reviewed and to share across devices. Smartphones do not typically meet screen size and resolution requirements for diagnostic purposes. An example of viewing software is the app eFilm Mobile. Patient education can be a key component of successful imaging as patient cooperation is often necessary. Patient education apps may improve the patient’s understanding of their procedure and reduce procedure-related anxiety. 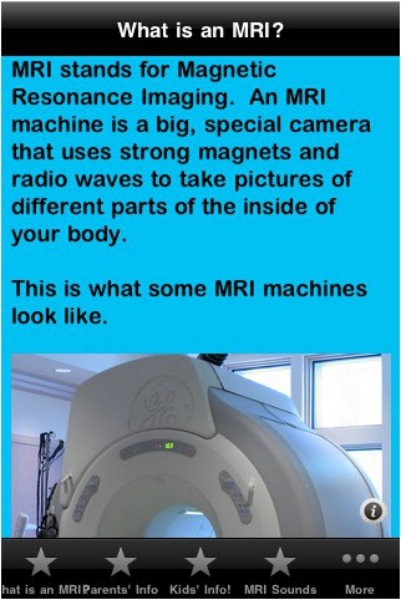 The authors noted an example of this type of app is Child MRI Prep. This app prepares children for an MRI using developmentally appropriate education methods. State-of-the art hospital information systems integrate patient records, lab tests and radiology images and results. Several apps have been developed to allow physicians to access records including imaging results for remote access. The authors tallied the number of apps by category and application platform store. Of the 321 radiology relevant apps, the majority (172) were present in the iTunes store and 108 were available in the Google Play Android app store. 31 apps had both an iOS and Android version. Relatively few radiology smartphone apps were available for Windows or Blackberry platforms. The promise and perils of smartphone app development in radiology mirror those in other medical domains. Many apps have been developed but the medical reliability and validity of these apps is often unknown. 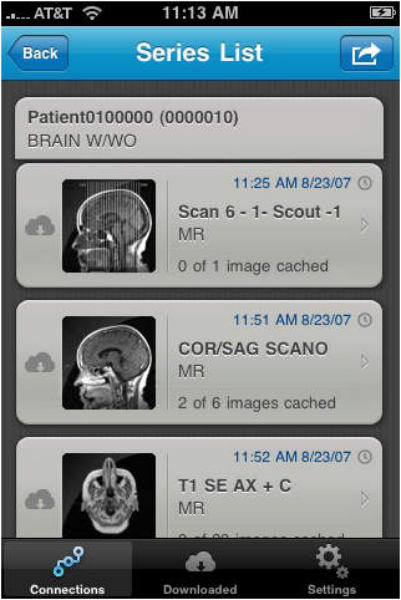 There is a need for real-world research-based testing of apps in radiology. Readers with more interest in this topic can access the free full-text manuscript by selecting the link below.